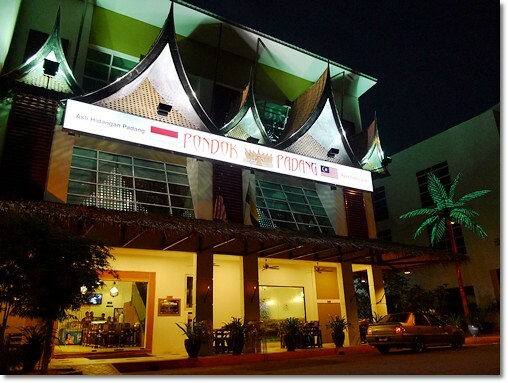 If you have been driving around Ipoh city lately, you must have noticed the many buntings hanging from the lamp posts along the road promoting a certain “Pondok Padang” restaurant situated at the new business centre named 1Casuarina beside Impiana Hotel on Jalan Gopeng (Jalan Raja Dr. Nazrin Shah). 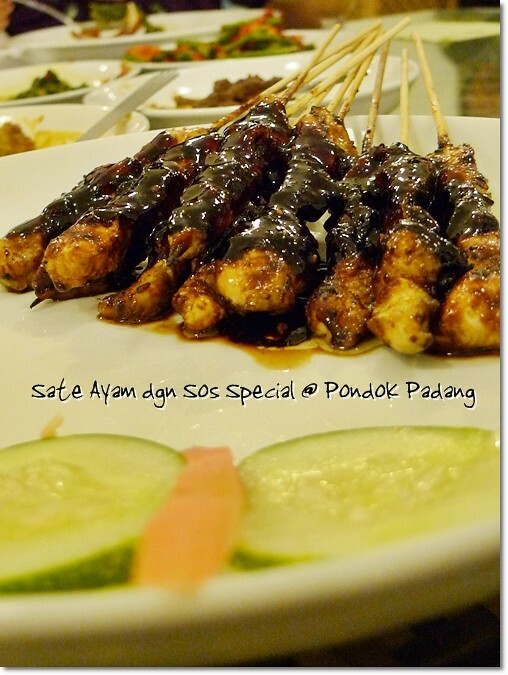 Sate Ayam (10 skewers at RM9.00/USD2.70) – Notice the difference between these and the usual Satay? No side serving of peanut gravy, but instead the black “Special” sauce was drizzled over the grilled meat on skewers. Pondok Padang is new to the Ipoh’s food and beverage scene, being the second high-profile “Hidangan Nasi Padang” restaurant after the booming Restoran Simpang Tiga over in Greentown.They claim to serve the most authentic form of “Hidangan Padang“, or “masakan Minangkabau“, originating from our neighbouring country, Indonesia. 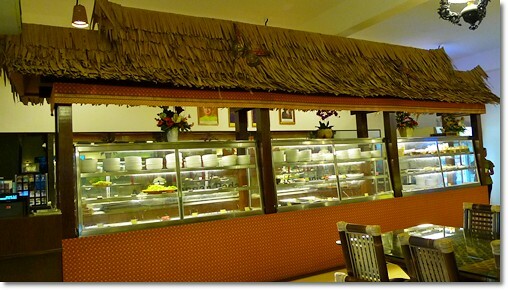 A genuinely rustic, ‘kampung’ ambience was relived in the decor of the restaurant. Aside from utilizing the skillful hands of Indonesian chefs, Pondok Padang also imported the handmade bamboo furnitures! Talk about committed to the true essence of enjoying a Minangkabau feast. The restaurant operates 24 hours, supposedly. But as of now, they’re only opened from 10am until 3am (yes, more than 12 straight hours!) to test the waters, so to speak. So, wondering how did Pondok Padang fare against Simpang Tiga? Read on to find out ….. The counter with glass display for you to pick your preferred dish(es) to go along with your rice. 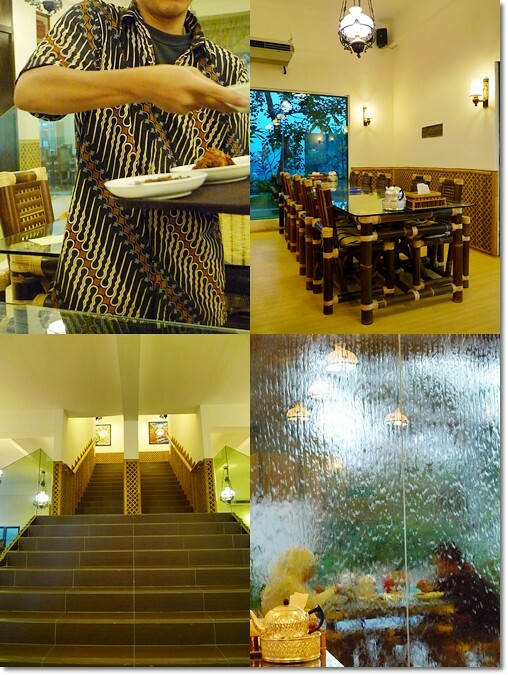 The restaurant did exude a comforting ambience, fully air-conditioned (unless you choose to dine al fresco on the outside), spanning two floors with ample parking spaces, and one can’t help but wonder how much the management must have invested in creating such a splendid interior. But we were not ushered to our seats, nor greeted the instant we walked in. The restaurant was empty aside from a couple of diners seated on the outside. The staff were busy chatting in full view of the customers (or lack thereof), and some chose to walk around instead of coming to us. Minor gripes, but a customer’s first impression plays a vital role in ensuring future visits, so they should be aware emphasize on this issue. Currently, Pondok Padang is offering a promotional lunch set at only RM8.50/USD2.60 per person. So those who wish to sample their cooking without going all out, or going in a small group can opt for the value for money sets. The set comes with a choice of beef/kampung chicken/fish or lamb with vegetables and a drink as well as a dessert. I was there for dinner, hence was presented with an ala carte menu. But here’s the problem. You cannot choose the dishes as you please from the menu, for it depends on the day’s dishes which are readily-cooked and displayed in the glass counter ala ‘nasi berlauk‘ fashion. This means that you are not getting freshly cooked food, but instead some meager leftovers from lunch or whenever they cooked them. Of course, in their defense, it may not possible to cook everything per order, since their menu is rather extensive. There is a separate ala carte menu however, where you can choose to have some dishes cooked on the spot, and served hot from the kitchen. Trust me, you SHOULD go for these instead of the cold options from the counter. 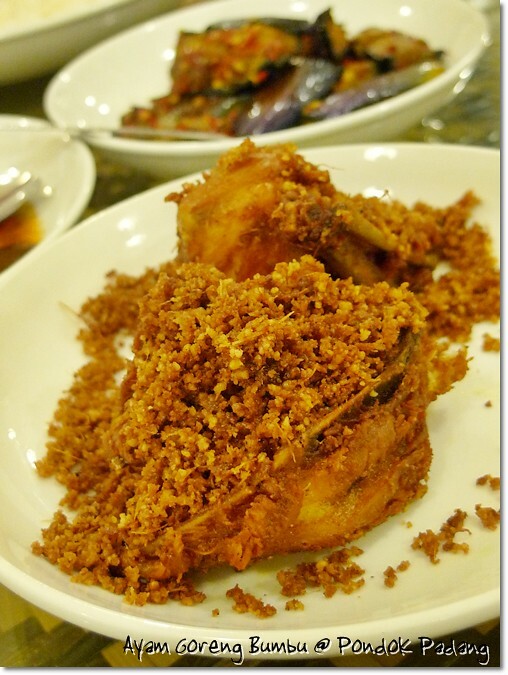 The Ayam Goreng Bumbu (RM5.20/USD1.60) which was already cold, and far from crunchy. Hence I picked 6 dishes from the counter, and ordered another 2 dishes from the kitchen. The fresh, piping hot serving of Kacang Panjang Masak Sambal Udang (Long bean stir-fried with Prawns in Spicy Sambal Paste) cooked per order fared so much better than the already cold, mash of Gulai Daun Singkong (Tapioca Leaves cooked in a Coconut Milk-based gravy). The Gulai Ayam (Kampung Chicken/Free-Range Chicken cooked in a spicy and rich turmeric-based gravy) and Rendang Sapi (Beef rendang) were the better choices amongst the others. The Ikan 3 Rasa (Three-Flavoured Fish) was the poorest; a heavy stale, fishy taste and extremely salty sauce made up the disastrous ensemble. 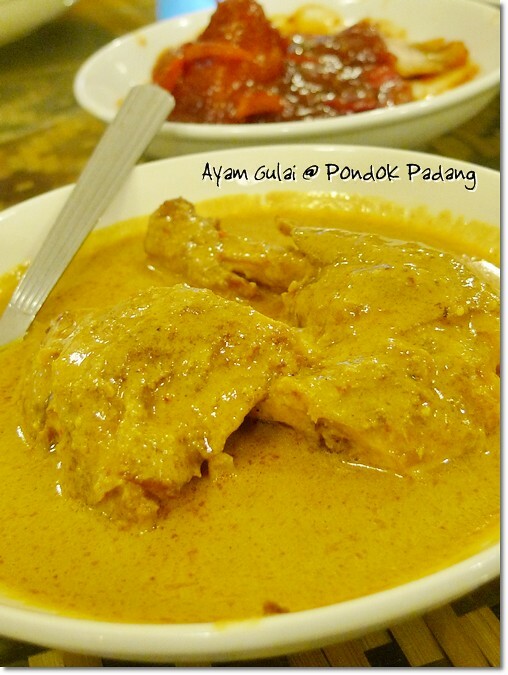 Gulai Ayam (RM5.20/USD1.60) was good, the gravy perfect to drench your white rice. But preferably served hot, or at least warm, rather than cold. Kacang Panjang with Sambal Udang (RM5.50/USD1.70) – Good choice to have your dishes cooked from the kitchen, as in this case. And the plump, succulent prawns were nice additions too. White rice is free-flow, meaning you can ask for extras if you feel like going for a carbo overload. Some hits, some misses; Pondok Padang does offer something different from the usual Malay style of Nasi Berlauk served at various warung‘s all over Ipoh. The avocado juice appeared a lacklustre, gloomy light green with chocolate sauce drizzled sloppily. Definitely not as interesting as say, the ones we had back in Bali. 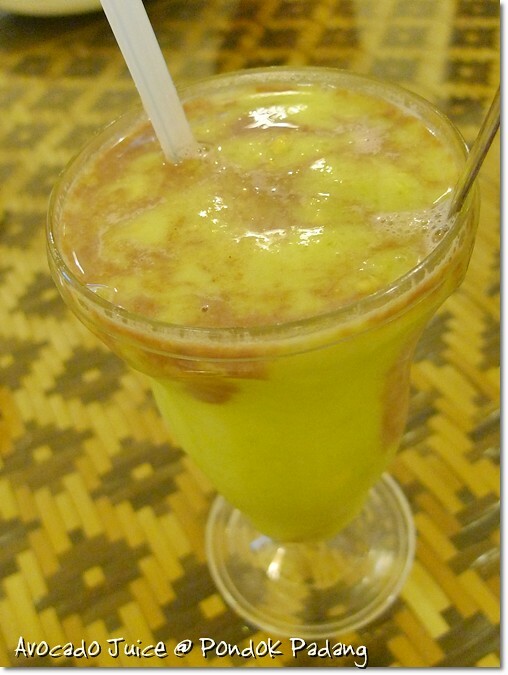 Looks aside, the avocado juice at Pondok Padang was creamy, of the right consistency, and none of that artificial taste like Simpang Tiga‘s version. Surprisingly … and the chocolate sauce added just a touch of sweetness to the beverage. Elegant from the inside out, Pondok Padang is a good choice if say, you wanna hold a function, or just wanna dine in style the HALAL way. If they can iron out the laments such as the slightly disappointing quality of service and food being served cold rather than piping hot (they could have offered to reheat the dishes), I am sure they will be a force to be reckoned with amongst the Ipoh’s Halal food scene. Directions : Situated at the new 1Casuarina business centre, next to Impiana Hotel (previously Casuarina). Next to Pondok Padang is the equally new Wasabe Japanese Buffet Restaurant. Had a bad experience in Simpang Tiga.. reading your introductory about staff being oblivious of customers, well, certainly a very common attitude too as in ST. A no no for me in this one.. but .. the satay looks different though… how was the taste? The satay was good, less of the ‘kunyit’ (turmeric) taste in the commonly marinated ones, but the thick, sweetish sauce with bits of chopped peanuts (and lots of oil!) was a refreshing difference. The place looks elegant from outside.. but I’m not really a fan of Nasi Padang, more so the nasi berlauk style.. Never felt comfortable ordering pre-made dishes without knowing how long they’ve been there or how many flies have landed on them. LOL! 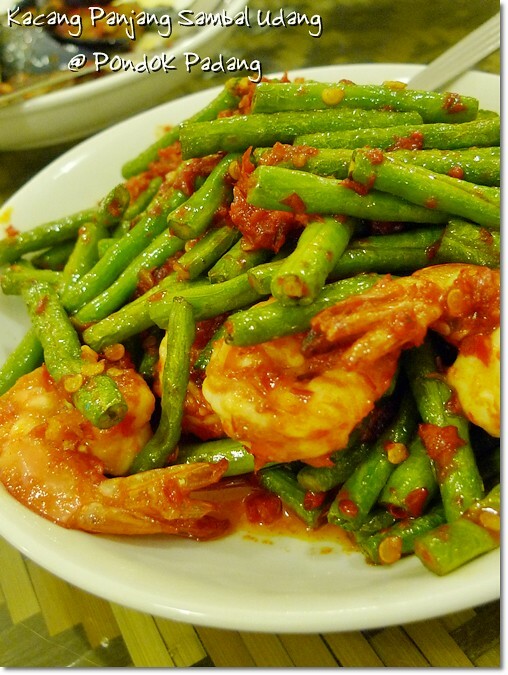 Yummy..the kacang panjang sambal udang looks delicious! Yup, the sambal was good, complementing the crunchy long beans with plump prawns very well. One of the better dish that evening, not only for its freshness. Oh dear. What a waste. The place looks nice, but it’s nothing without good food & service – hopefully they can fix all the problems soon! I am sure they will change as time goes along. Right now they need to gain the people’s trust and subsequent patronage. That’s most important. Though the lady whom served us was pleasant enough. The same can’t be said about the rest of the staff though. We felt almost invisible when walking in, without them even raising an eye …..
alamak.. food served cold is such a put off unless its meant to be a cold starter or something! still, good to know nice Malay food joints in Ipoh to take my clients! So this is the place the buntings were talking about. The buntings are placed in the middle of the road with such small writings and the colours were all wrong and they expect drivers to grasp the information on those buntings when driving along! It nearly caused me to knock into a car in front of me when I was driving along the road behind the Ipoh airport near the traffic light. Better go get someone else to design the buntings for you before any accident happened. BTW the buntings are placed in the middle of the road so they are meant for people on the move. Indeed, the words Pondok Padang can be seen, but not the location, contact number or even the location map. I guess we Malaysians are used to piping hot food. 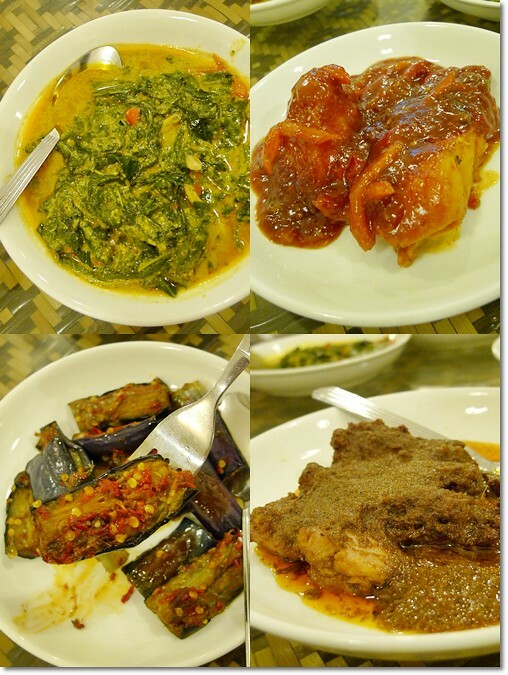 Generally Padang food are all that one see on the shelves and served direct from there. Some may go through the hot oil treatment. The ayam bumbu looks nice. If there is ayam pop try it. Marinated in small onions, tomatoes, lime juice and then poached together till tender. Chicken will be put through the hot oil dippingjust before serving. Yup, I do not mind if the dishes are served that way, like our Chinese economy rice stalls. Even Simpang Tiga also serves the dishes that way, during lunch hour especially. BUT, when the dishes were obviously leftovers from lunch (only a few pieces of fish left, the squids left only a plateful, and chicken all soggy … and this was barely 7pm! ), it kind of gave the customers a not so good impression. It’s different if they cook the dishes for dinner instead of serving the customers with cold, leftovers. And the two pieces of Ikan 3 Rasa were all that was left. Already cold, with an unpleasant fishy taste. the satay really looks nice…would like to try it:) i also noticed tat the price isn’t tat expensive, reasonable indeed.. But nasi padang normally sejuk one.. i normally avoid it, as cold food = possible detention in toilet for me unfortunately 🙁 but the gulai looks nice… i like sauce! The price is soo expensive.. 10 pieces of satay cost u RM10.00?.. Wow!!!.. Better eat Nasi Kandar Salim at Jalan Kampar near the roundabout MGS School.. RM8.50++ only and with full stomach..
is it halal? i saw the worker not muslim, why?? why have people not muslim worker there chinese n indian, it is so disgusting. Disgusting? Wait, even though McD, Kentucky and Pizza Hut are all Halal outlets, they DO recruit non-Muslims to run the place. Anyway, JKM, the restaurant was completely run by Malays (some of them from Indonesia, judging from their slang) when we were there. Nothing disgusting about that, and neither should you feel compelled to write off a restaurant for the sake of recruiting non-Muslim staff. Hi JKM, of course a Muslim should be concerned of an eatery’s Halal status, whether the certification is for real (from JAKIM) or only certified by the other organizations (there’s one Asia-Pacific Islam Research Body or something), or worse …. a certificate that’s not genuine. But we should not generalize and grade an eatery based on the race of the workers in such an establishment. You do see various chef, cooks, waiters etc in Halal restaurants, fast food outlets, and cafes. Not ALL of them are Malays, but the Halal criteria does list the basic requirements for an eatery to be termed as Halal. To be sure, you can check the authenticity of the certification displayed, get the restaurant’s name and cross-checked with Jakim if you insist, but try not to judge a restaurant based on the multi-racial workers running the place. yourself? Either way keep up the excellent quality writing, it is rare to see a nice blog like this one today.